Now get rid of annoying and irritating rattling sound with help of these damping sheets. 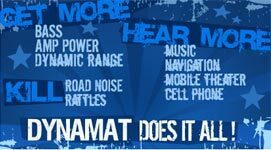 We being dealer of 'Dynamat' a specialized material applied to the specific area of the car help to eliminate the rattling sound caused due to excessive bass. This sheet is also applied on the opposite surface to the speaker's magnet to avoid speaker back wave distortion. Applying damping material to the doors of your vehicle can reduce road noise up to 6 dB! This is a huge reduction in noise. Complete coverage for an average vehicle can reduce road noise as much as 18 dB!